The center of the disk, called nucleus pulposus, is made up of cartilage material, which has the consistency of a gel; imagine a water-filled sponge. If you apply pressure on the sponge from above, what would keep the water from running off to the sides? To contain it the evolutionary engineer designed a ring around the center, called anulus fibrosus, which means fibrous ring. And that’s exactly what it is: a ring of collagen fibers. The picture below shows why those collagen fibers can withstand the tremendous forces exerted of the nucleus every time we pound the pavement, and prevent the water and the gel from leaking out. No engineer can outdo the genius of nature, so why not pay the ultimate compliment and mimic it? Indeed, Lawrence Bonassar, a biomedical engineer at Cornell University, and his team reported their invention in the August 1, 2011 issue of the Proceedings of the National Academy of Sciences. They created an artificial scaffold shaped like a disk, with collagen on the outside to provide structural stability and a gel in the center. But that would not be enough: the natural disk is a living, continuously self-renewing structure. In the nucleus pulposus there are specialized cells calledchondrocytes that continuously synthesize new cartilage to replace the old one, that gets eroded with time. Likewise, the annulus fibrosus contains cells called fibroblasts that synthesize new collagen to replenish the eroding ring. So they added fibroblasts to the collagen, and chondrocytes, which they seeded into the gel. For 2 weeks, they let the cells grow around the scaffold, creating a living disk and taking over both parts of the artificial scaffold. The bioengineered disk provided as much cushioning space between spinal vertebrae as a typical disk does. Moreover, cells from the implant didn’t just populate the space within the scaffold—they started growing outward into the rest of the spine, as the cells in a normal disk do. 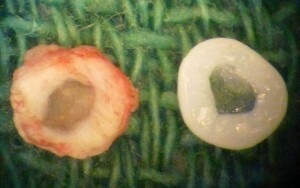 The picture below shows the natural disk (left) and the artificial/natural-like disk (right). Next Post MHA Does CLABSI Right!